Beaverton, OR — Ex Novo Brewing Co.
It’s been a dream of ours for some time to open a second tap room. An extension of the pub we built in North Portland in 2014 with the same great beer, great food, and great experience folks have come to expect from Ex Novo. It was clear that our next project needed to be outside of Portland, and the feedback from our fans around the metro area has always been strong. So when the City of Beaverton was looking to bring more businesses to the Downtown District we found inspiration and community in the Cady building. Ex Novo is thrilled to open on the corner of Farmington and Watson. Carrying over from our company values and pub tradition, we commit to investing in our surrounding community and continuing the growth of Downtown Beaverton as a dining and drinking destination. Cheers! 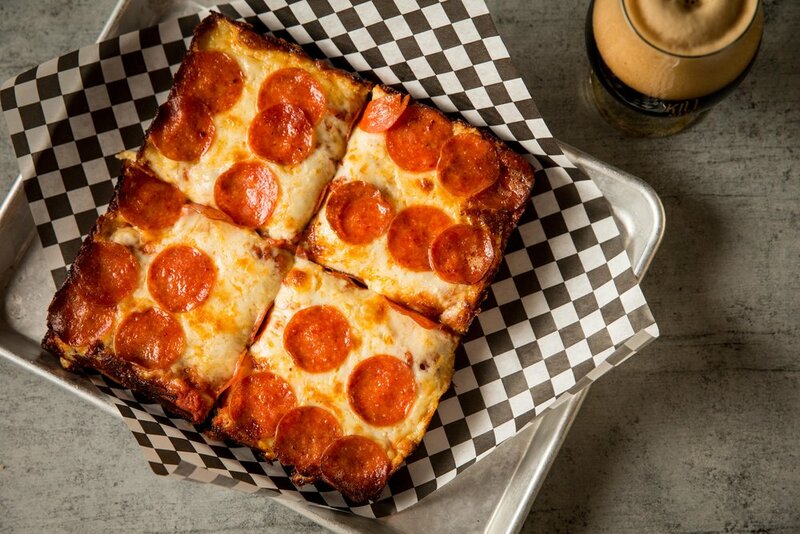 Deep dish, shareable Detroit-style Pizza is the focus of our Beaverton location. Signature pies and customizable pies all available onsite or for takeout. Stop in to check out our ever evolving taplist of year-round, seasonal, and one-off beers to enjoy here or take home! Grandma’s Baked Meatballs, Marinara, Parmesan. Garlicky Butter, Brick & Cheddar Cheeses, Parmesan. Served With Crazy Sauce & Ranch. .Parmesan, Calabrian Chiles, Gold Dust. Smashed Marinated Heirloon Cherry Tomatoes, Fresh Mozz, Balsamic Reduction, Basil, Ciabatta. Roasted Potatoes, Brick Cheese, Red Onion, Pork Floss, Black Garlic, Ranch, Scallions. Mixed Lettuces, Artichoke Hearts, Piquillo Pepper, Red Onion, Hop Vinaigrette, Parmesan. Mixed Lettuces, Feta, Castelvetrano Olive, Marinated Red Onion, Roasted Beets, Creamy Red Wine Vinaigrette. Romaine, Caper Parmesan Caesar, Garlicky Croutons, Parmesan. Zucchini, Edamame, Rocket Pesto, Strozzapreti Pasta, Fresh Mozz, Toasted Pine Nuts, Parmesan. Grandma’s Meatballs, Brick Cheese, Crazy Sauce, Parmesan, Ciabatta. Brick Cheese, Marinated Red Onion, Shredded Lettuce, Creamy Red Wine Vinaigrette, Ciabatta. Brick Cheese, Hard Boiled Egg, Pork Floss, Truffle Aioli, Parmesan, Ciabatta. Smoked Mozz + Gorgonzola, Smashed Heirlooms, Black Garlic, Tomato Jam, Ciabatta. No Substitutions. See Build Your Own Options. All pizzas come with sauce on top. Sauce under cheese available upon request. Crazy Sauce, Smoked White Cheddar, Green Chile, Double Smoked Sausage. Brick Cheese, Crazy Sauce, Meatballs, Mama Lils, Fresh Oregano. Crazy Sauce, Brick Cheese, Pepperoni, Mortadella, Meatballs, Double Smoked Sausage, Bacon. Roasted Garlic Ricotta, Double Smoked Sausage, Bacon, Roasted Potato, Chard, Parmesan, Aberquina Olive Oil. Brick Cheese, Shredded Chicken, Bacon, Red Onion, Crazy Sauce, Ranch. Brick Cheese, Goat Cheese, Marinated Red Onion, Wild Mushrooms, Black Garlic, Fresh Basil, Crazy Sauce, Balsami Drizzle. Brick Cheese, Honey Ham, Pineapple, Calabrian Chiles, Pork Floss, Crazy Sauce, Scallions. Cashew Mozz, Chile Chickpeas, Broccoli Rabe, Smashed Heirlooms, Creamy Garlic Tahini, Nutritional Yeast, Crazy Sauce. Brick Cheese, Fresh Mozz, Asparagus, Zucchini, Edamame, Rocket Pesto, Truffle Oil. Go vegan- sub cashew mozz for $2 on 6" or $3 on 8". Built with Brick Cheese and choice of Crazy Sauce, Rocket Pesto, or Arbequina Olive Oil. Brick Cheese, Roasted Garlic Ricotta, Smoked Mozz, Smoked White Cheddar, Cashew Mozz, Gorgonzola, Feta, Goat Cheese. Meatballs, Pepperoni, Mortadella, Chicken, Honey Ham, Bacon, Double Smoked Sausage, Anchovies, Pork Floss. Green Chile, Castelvetrano Olive, Arugula, Pineapple, Mama Lils Peppers, Marinated Red Onion, Roasted Potatoes, Piquillo Pepper, Artichoke Heart, Calabrian Chiles, Edamame, Scallions, Chile Chickpeas. Ranch, Truffle Oil, Sriracha, Balsamic Glaze, Creamy Garlic Tahini, Hot Honey.